Tim makes name tags in our shop. It's a job in which he takes great pride and care - for each and every order! These tags are made of wood and bring a unique and crafted look to your case. Order one or more - for yourself or your young musician! Early in life I was diagnosed with a brain tumor and given little hope of surviving. After four major brain surgeries, chemotherapy, and radiation I was doing alright. I had a bit of a set back with a stroke a few years ago and I still struggle with limited movement and hearing loss from Chemo and Radiation treatments. After graduating from high school I was looking for a way to support myself. After some time with my Dad we came up with the idea of using my motivation for graphics, as well as working with my hands, to make quality custom name tags and house tags. I hope I will be able to expand and offer more designs and items in the catalog soon. This has been an exciting project and a lot of fun. 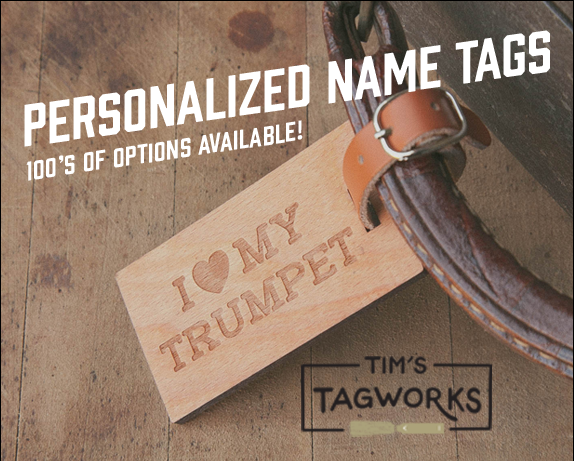 If you have an idea for a tag you'd like, please let me know!